THE current faceoff between the West and Russia was a main topic of the Winter 2015 issue of Horizons. Despite some sharp differences in the views presented in our pages, one striking commonality was an appreciation of the contemporary world’s vulnerability to unanticipated escalations of regional tensions. THE Spring 2015 issue of Horizons is largely devoted to the Middle East. Since the turn of the century, various developments have led to an exacerbation of historical challenges in that turbulent corner of the planet. Today, throughout the region we are witnessing realignments of relationships and remakings of spheres of influence. The Middle East appears to be in the midst of a great unraveling of the system whose foundation was laid out a century ago by the Sykes-Picot Agreement. AS the present issue went to press, two significant announcements were made: a framework accord between the P5+1 and Iran on restricting the latter’s nuclear program in exchange for relief from economic sanctions, and an agreement by the Arab League on the principles of establishing a joint military force. JUST a few years ago, these would have hardly been imaginable. Both are related to the emergence of some extraordinary challenges. These include the failed hopes ofthe Arab Spring, Syria’s humanitarian catastrophe, the further embitterment of the Sunni-Shia divide, a renewed ascendancy of ethnic and tribal grievances, and the near death of the Israeli-Palestinian peace process. Perhaps the most conspicuous is the rise of ISIS—a group that, in waging its merciless campaign of terror, rejects most common civilizational norms and denies the legitimacy of all existing borders and demarcations. REFORMERS, reactionaries, and revolutionaries adhering to a wide range of identities are enmeshed in an increasingly contentious struggle across various theatres. Few stand in defense of the regional status quo; fewer still believe it can be maintained. ALL told, the rapidity and scope of the changes taking place in the Middle East make for an exceptionally dangerous set of circumstances. This will inevitably have an impact on adjacent geographies and contribute to wider geostrategic convulsions. THE steep drop in oil prices has brought to the fore a number of energy security questions. 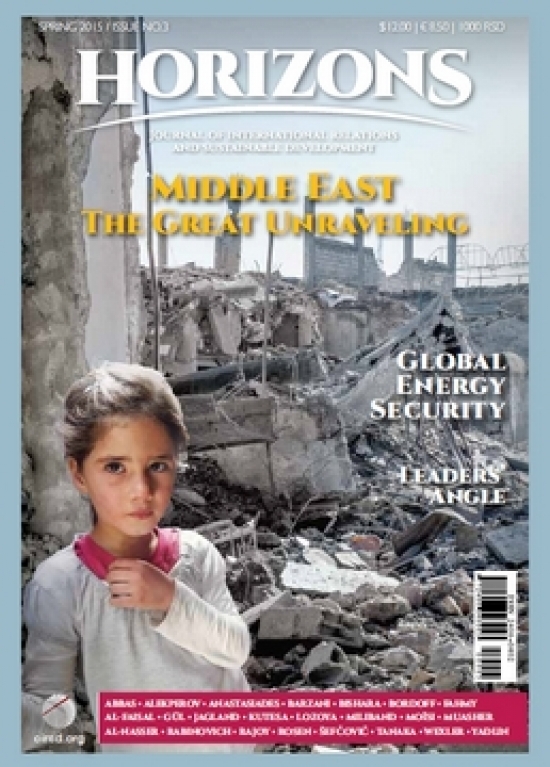 The present issue of Horizons also includes articles addressing this critical topic, including thoughts on the prospective European Energy Union, America’s efforts to secure energy independence, the changing role of nuclear power, and the historic reforms of Mexico’s energy sector. Last, but not least, we present the UN General Assembly President’s views on three interrelated strategic multilateral processes—financing for development, the UN post-2015 agenda, and climate change negotiations—all of which need to be completed before the end of this year.